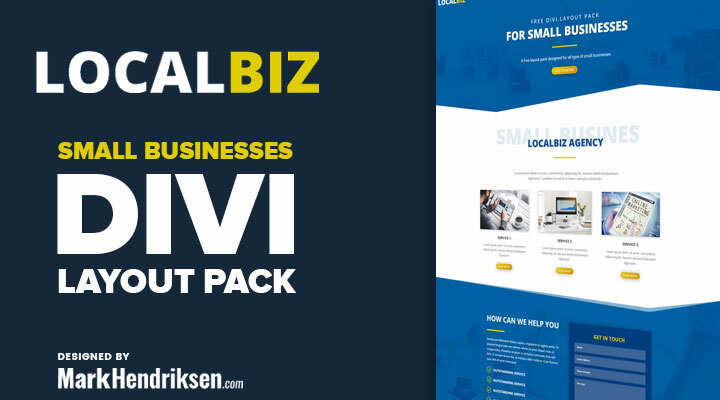 This is a Free Divi Layout pack designed for all types of small businesses. 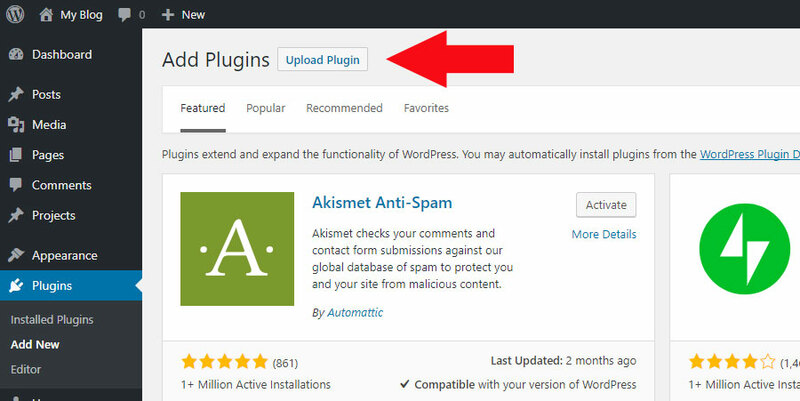 In your WordPress dashboard navigate to Plugins and click on Add New. Then click on Upload Plugin. Click on Choose file and locate the localbiz-demo-import.zip file on your computer and then click Install Now. 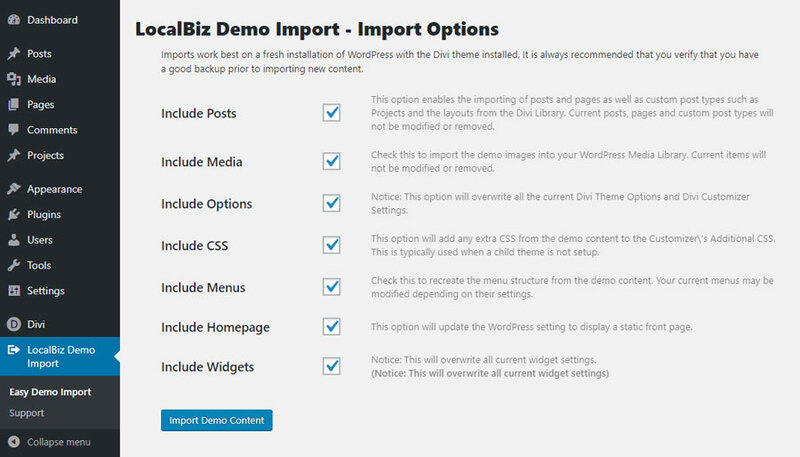 In your dashboard there is now a new option visible on the left side “LocalBiz Demo Import”. Go to LocalBiz Demo Import > Easy Demo Import. This looks really good, Mark! Thanks so much for sharing! Amazing work once again. I can’t thank you enough or the valuable layouts you design. Thanks for sharing. You are a good boy (as your mother would say)! I have sat on the sidelines watching you create one masterpiece after another. This newest submission fits within that same description. Outstanding! Thanks for the kind words Sally! Hello Mark, thanks for this blinding layout … I have failed to find the plugin that you said is to be used for the “import”. Thank you Mark for sharing this very nice layout. Got a few questions however. 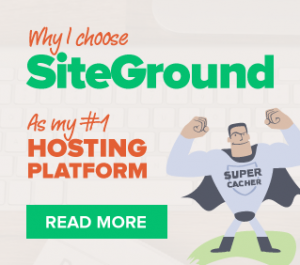 Can your plugin be used on WP Multisite? Can the plugin be deleted after installing the layout? can you send me json file of this layout? You can download the layout pack above the comments. Something is not working in step 3. After installing it I can´t see a new option called that way. I´m sorry, it works, but the option is in a different place. Ye, sometimes it appears at the top of the sidebar first. I can’t view your website you have it in maintenance mode. Hello Mark. Thanks for offering this fantastic layout and for FREE you are simply amazing! I am experiencing a slight issue with this layout after I installed it to WordPress. Once installed the layout completely changed. The vectoring is gone and the headings are in different fonts and positions. Any idea as to why this would happen? Could you send me an email to [email protected] with the URL and login. Than I;ll have a look. I love this layout! Thank you for making it available. I imported the files, but I think I’m missing the custom CSS. There is nothing in the CSS field box, and I don’t have the CTA button in the header menu. Also, the header on my site looks different than the demo. I have sent you an email with the CSS. can you please send me the CC field box for “GET IN TOUCH” like in demo. Hello Mark, its looking really great. But i am missing the corners? i have just straight lines. I love this layout! Thank you for making it available. Wow… The most professional layout I’ve seen anywhere. Thank you so much for sharing this! Thanks, Mark. You’re saving us so much time with your layouts, and we’ve been using and loving DIVI for a few years now! Keep up the good work and since we’ve used all your free layouts; I guess we’ll start purchasing your Child Themes now, lol! Excellent layout but when I try to do Localbiz demo import it fails with some error message. Try to next time I am getting message Previous import failed. Resetting import values…. Is it possible download json file instead please. You can download it just above the comments section. Love this theme, having some issue though. Trying to change the color scheme from dark blue, I can find everything but the section dividers (waves) etc. Any chance you have documentation on how to change that or other sections. To change the divider colors open that particular divider and go to the design tab. Then under dividers you will find the divider color. Thank you so much for this great job . it really helped me a lot and save me time . I have a problem editing the last section before the footer : Quick menu Our Services. Contact Us . What do you need to know about that section? Thank you for creating and sharing this great theme! It’s been a pleasure to work with. Unfortunately, I foolishly refreshed my Divi Theme Options, and lost the Custom CSS that installing the Layout had imprinted. Can you please send me the code that I can cut and paste back into the CSS field, on that page? Just mailed them to you. How can I change color combination ? on all pages. Some colors can be changed in Divi > theme customizer others in the sections. rows and modules on the pages. Hi, Thank you for this great work ! I changed colors of svg image with illustrator, how to integrate it to my pages ? Open that section and in the design tab you can change the divider. Great Job Mark! Your one of a kind giving a freebies like this is a big help! Anyway, I have question? Is the navigation like the menu on top can be edit? also the LOcalBiz logo? How can we edit that? It seems that it cannot be edited in visual builder though. Thanks in Advance! Keep up the good work! Could you also email me the customized CSS styling that make this design so appealing? Love this theme, Mark!! It is my first try at Divi and your theme is so clean and enjoyable. How do you change the formatting for the GET IN TOUCH button to a different page? Hello Mark, thanks for this brilliant layout … I have imported demo plugin and work according to guide but it did’t work. Please Have look on my website. What is not working? I do see your website. How can I fix this asap? You need to update your Divi theme. You probably using an older version without the divider option. After that, you need to reinstall this layout pack. Need just one help, whenever i select import, it prompts running import and stays the same way without the completion of process. Will a JSON file make the difference. Please assist. I send you the json files. Thank you for your wonderful theme and generosity. Could you please send me the json files as I am having problems with the plugin. Are just see your demo website? The “Background Section” of “Contact Form” is not working properly. Can you please let me know what’s the problem? & please fix the problem ASAP. Open that section and disable the paralax effect at the background image. I just did that & it is working perfectly. But why it is an error like that? Because everything was working perfectly previously. Once I import the layout Can I uninstall that plugin? If, yes will not be there any problem in future? Do you have a site that I can read through that tells me how to integrate what was on my site into your theme? I already have a year + of content and I am just trying to make my site look more attractive. When I downloaded your theme all my content is still in the dashboard just not showing up in the visual view at all. I’m wondering what I did wrong and how I can fix it. any assistance would be appreciated. I love the layout, thank you! This isn’t supposed to be installed on an existing website. Before installing you get a warning that it will overwrite the current settings. Best way to solve this is to restore a backup. In case you don’t have any send a mail to [email protected] and I’ll see if I can help you out. Great theme as always. I am not sure what’s going on but if you scroll down on the homepage and go to the contact form section with the blurbs to the left the image loads and then disappears to a white background. How do I fix that? This happens cause of a bug in Chrome. If you open that section and disable the parallax effect of set it on true it should work. I cannot download from the link. Is there any other link you can give me to download? Thanks! I would like to use it. Thanks! Sorry just fixed the link. You need to register for a free membership. Inside the member area you will find all the free layout packs. Thank you so much for this FREE layout pack! I’m new to DIVI and I’m struggling to change the colour of the H2 elements on the home page. When inspecting the code I can see there is an !important element so it shows as blue. Can you point in the right direction to change the colour. Open the text module and go to the design tab. Under Heading text click on H2 here you can change the color. Hi Mark, Thanks for this layout.ilove it. I just used this layout pack on a site! You are really great at the layout and design! how do I change my old website design using this layout..
You have to create the pages again and use my layouts for those pages. There is not an easy way to integrate layout packs for existing websites. can you delete the plugin after the import ? yes you can remove the plugin after import.